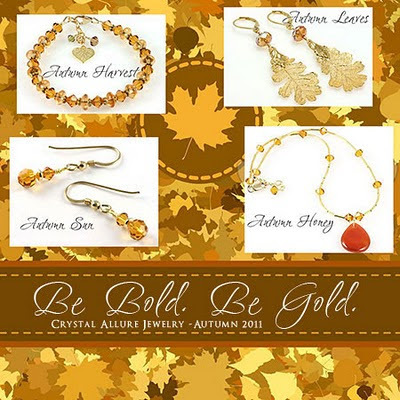 Autumn is rich with crystal gold jewelry! We are now in the fall equinox and I couldn't be happier! After a dry, parched, sticky summer, I'm really looking forward to autumn's changing leaves. When the leaves start to change, especially on an oak tree, the first color you tend to see is a rich golden yellow. Inspired by this beautiful sight, I've put together a beaded jewelry board of my favorite gold and Swarovski Crystal beaded jewelry for you. Earlier this year I was contacted by one of my best customers, Mary Kay, requesting a beaded wedding jewelry set for her upcoming son's wedding. 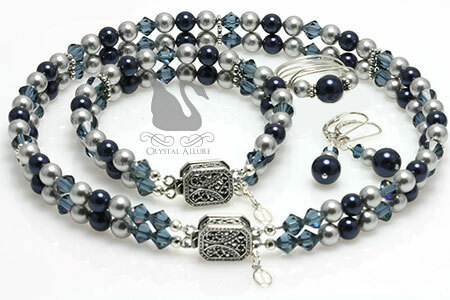 I was honored to have been chosen to design this special wedding set for the Mother of the Groom. The true feature of this beautiful set is the gorgeous filigree clasp that complements her shoes and handbag accessories perfectly, with that just right classic elegance. While on a trip, Mary Kay had already found her perfect dress, a rich navy colored Patra designer dress (RN #65518). 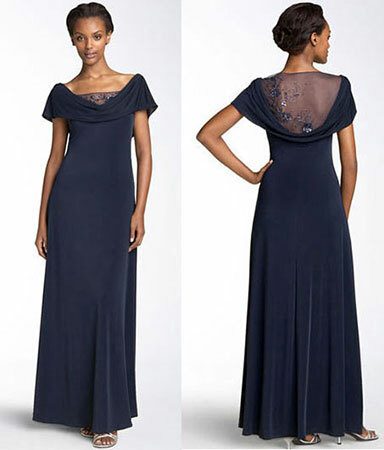 This dress is truly beautiful because of the beaded illusion mesh inset at the neck with a softly draped neckline. 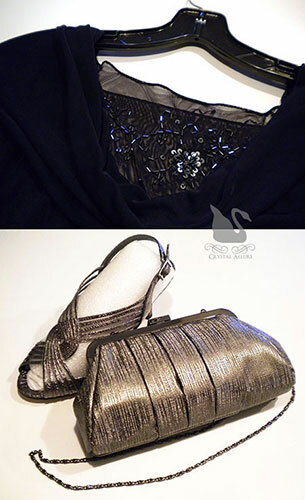 Mary Kay had sent some photos of the dress but the color was not showing true, so she decided to come by the studio with her dress and accessories. Based on the color she said it was, I placed out a palette of Swarovski Crystals and Swarovski Pearls that were options to coordinate with her dress. Mary Kay brought her husband and between the three of us, we chose a light grey and night blue Swarovski Pearl with a montana blue Swarovski Crystal. We discussed further the details of her look for the wedding day and with some notes jotted down, the ideas began to flow. 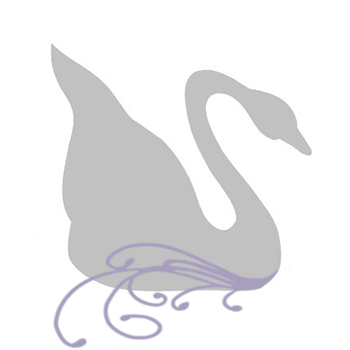 I had a lot of time ahead of me, which was perfect, since the wedding was not until August. Mary Kay's Custom Crystal Pearl Mother of the Groom Wedding Jewelry Set includes a beaded 2-strand choker, bracelet, earrings and wire-wrapped ring. The choker style necklace is a great complement to a portrait/off the shoulder style dress. And Mary Kay will be in full fashion at this late summer wedding with her selected picks of elegant embellishments and an illusion neckline. It was my pleasure to have designed this very special wedding jewelry set for Mary Kay! And a special thank you Mary Kay for selecting Crystal Allure for her custom beaded jewelry and for the bridal referral. I cannot wait to receive pictures of this beautiful wedding. Prior to Mary Kay contacting me, she had referred her future daughter-in-law to Crystal Allure for her bridesmaids jewelry sets. These custom handcrafted designs will be featured soon -stay tuned. It's been a very dry summer, so far. It's been so dry that our grass looks like hay. As a result, we haven't had much activity in the butterfly garden this year. On one lucky Friday evening (July 22, 2011), I happened to catch the fluttering wings of this beautiful White Admiral butterfly in our garden. It contently stayed put, eating away at the butterfly bush nectar, while I snapped numerous photos. Generally our first visitor to the butterfly garden is a monarch, but I really haven't seen many butterflies at all. Although, in fairness, I haven't been outside much either...too darn hot! crazy waving my hands around my head as I didn't want to get stung. 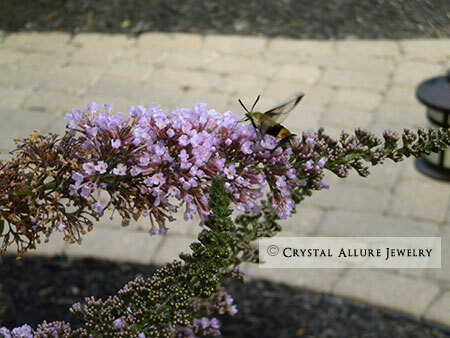 When I finally got out of the garden and looked back, I kept hearing the buzzing but almost didn't catch this little guy fluttering around as well, on the other butterfly bush. This is the second year I've spotted a hummingbird hawkmoth. When I first saw one I thought mother nature messed up on this thing. But, thinking logically, I knew it had to be something, so I did some searching and found out it was a hummingbird hawkmoth. It flies like a hummingbird but has the body of a moth, the coloring almost of a bee. Very strange indeed, but interesting as well. My neice was fascinated to be able to see both these lovely garden visitors. In fact, this past weekend she also was able to see a hummingbird and at least a dozen tiny monarch butterflies feeding on the butterfly bush. It was quite impressive how they flew around in a tangled weaving type pattern, yet never bumped into each other. I've got some baby robin photos to share as well. I didn't know there was a nest under our deck but once I figured it out (in truth...it was my dog, Lucy, who figured it out), I started snapping pictures to see how long it would be before they flew away. But the last few pictures have been, well...life threatening. :-) Mama Robin is NOT happy for me to be around her babes and she's pulled in some backup. So, I haven't been able to get daily pictures but will share soon the ones I did get.